That, by itself, is wonderful, for there are few people who remember that they have been to Faery or aught of all that happened to them in that state. In truth we do not go to Faery, we become Faery, and in the beating of a pulse we may live for a year or a thousand years. But when we return the memory is quickly clouded, and we seem to have had a dream or seen a vision, although we have verily been in Faery. It was wonderful, then, that Fionn should have remembered all that happened to him in that wide-spun moment, but in this tale there is yet more to marvel at; for not only did Fionn go to Faery, but the great army which he had marshalled to Ben Edair [The Hill of Howth] were translated also, and neither he nor they were aware that they had departed from the world until they came back to it. Fourteen battles, seven of the reserve and seven of the regular Fianna, had been taken by the Chief on a great march and manoeuvre. When they reached Ben Edair it was decided to pitch camp so that the troops might rest in view of the warlike plan which Fionn had imagined for the morrow. The camp was chosen, and each squadron and company of the host were lodged into an appropriate place, so there was no overcrowding and no halt or interruption of the march; for where a company halted that was its place of rest, and in that place it hindered no other company, and was at its own ease. When this was accomplished the leaders of battalions gathered on a level, grassy plateau overlooking the sea, where a consultation began as to the next day’s manoeuvres, and during this discussion they looked often on the wide water that lay wrinkling and twinkling below them. A roomy ship under great press of sall was bearing on Ben Edair from the east. Now and again, in a lull of the discussion, a champion would look and remark on the hurrying vessel; and it may have been during one of these moments that the adventure happened to Fionn and the Fianna. “I wonder where that ship comes from?” said Cona’n idly. But no person could surmise anything about it beyond that it was a vessel well equipped for war. As the ship drew by the shore the watchers observed a tall man swing from the side by means of his spear shafts, and in a little while this gentleman was announced to Fionn, and was brought into his presence. A sturdy, bellicose, forthright personage he was indeed. He was equipped in a wonderful solidity of armour, with a hard, carven helmet on his head, a splendid red-bossed shield swinging on his shoulder, a wide-grooved, straight sword clashing along his thigh. On his shoulders under the shield he carried a splendid scarlet mantle; over his breast was a great brooch of burnt gold, and in his fist he gripped a pair of thick-shafted, unburnished spears. Fionn and the champions looked on this gentleman, and they admired exceedingly his bearing and equipment. “And you have come to this realm,” cried Fionn, doubting his ears. “For tribute and sovereignty,” growled that other, and he struck the haft of his spear violently on the ground. “It is no small boast,” Cona’n murmured, staring at him. “Give out your deed,” Fionn commanded. And so harshly did he speak, and with such a belligerent eye did he stare, that dismay began to seize on the champions, and even Fionn felt that his breath had halted. “This son of Rona’n will not long be notable,” the stranger asserted. “He can outstrip the red deer,” said Cona’n. “He can outrun the wind,” cried Fionn. “He is not with us,” Cona’n lamented. “These notable warriors are never with us when the call is made,” said the grim stranger. “I will not hurt any of these people until you return,” he said. He had not gone a great distance from Ben Edair when he came to an intricate, gloomy wood, where the trees grew so thickly and the undergrowth was such a sprout and tangle that one could scarcely pass through it. He remembered that a path had once been hacked through the wood, and he sought for this. It was a deeply scooped, hollow way, and it ran or wriggled through the entire length of the wood. Into this gloomy drain Fionn descended and made progress, but when he had penetrated deeply in the dank forest he heard a sound of thumping and squelching footsteps, and he saw coming towards him a horrible, evil-visaged being; a wild, monstrous, yellow-skinned, big-boned giant, dressed in nothing but an ill-made, mud-plastered, drab-coloured coat, which swaggled and clapped against the calves of his big bare legs. On his stamping feet there were great brogues of boots that were shaped like, but were bigger than, a boat, and each time he put a foot down it squashed and squirted a barrelful of mud from the sunk road. Fionn had never seen the like of this vast person, and he stood gazing on him, lost in a stare of astonishment. “All alone, Fionn?” he cried. “How does it happen that not one Fenian of the Fianna is at the side of his captain?” At this inquiry Fionn got back his wits. “Yet tell it now,” the monstrous man insisted. Fionn, thus pressed, told of the coming of Cael of the Iron, of the challenge the latter had issued, and that he, Fionn, was off to Tara of the Kings to find Caelte mac Rona’n. “I know that foreigner well,” the big man commented. “Is he the champion he makes himself out to be?” Fionn inquired. “He can do twice as much as he said he would do,” the monster replied. “He won’t outrun Caelte mac Rona’n,” Fionn asserted. The big man jeered. “I know how to do these things,” the other man commented with a slow nod of the head. “I will do that,” the man replied. When they came among the host the men of Ireland gathered about the vast stranger; and there were some who hid their faces in their mantles so that they should not be seen to laugh, and there were some who rolled along the ground in merriment, and there were others who could only hold their mouths open and crook their knees and hang their arms and stare dumbfoundedly upon the stranger, as though they were utterly dazed. Cael of the Iron came also on the scene, and he examined the stranger with close and particular attention. “What in the name of the devil is this thing?” he asked of Fionn. Cael of the Iron grew purple in the face, and he almost swallowed his tongue through wrath. But at this the Carl burst into a roar of laughter, so that the eardrums of the warriors present almost burst inside of their heads. “I never run less than sixty miles,” Cael replied sullenly. “I don’t care how it is done,” Cael answered. “Let it be done that way,” said Cael. These two set out then for Munster, and as the sun was setting they reached Slieve Luachra and prepared to spend the night there. “I’Il build nothing,” Cael replied, looking on the Carl with great disfavour. The Carl stumped to a near-by wood, and he never rested until he had felled and tied together twenty-four couples of big timber. 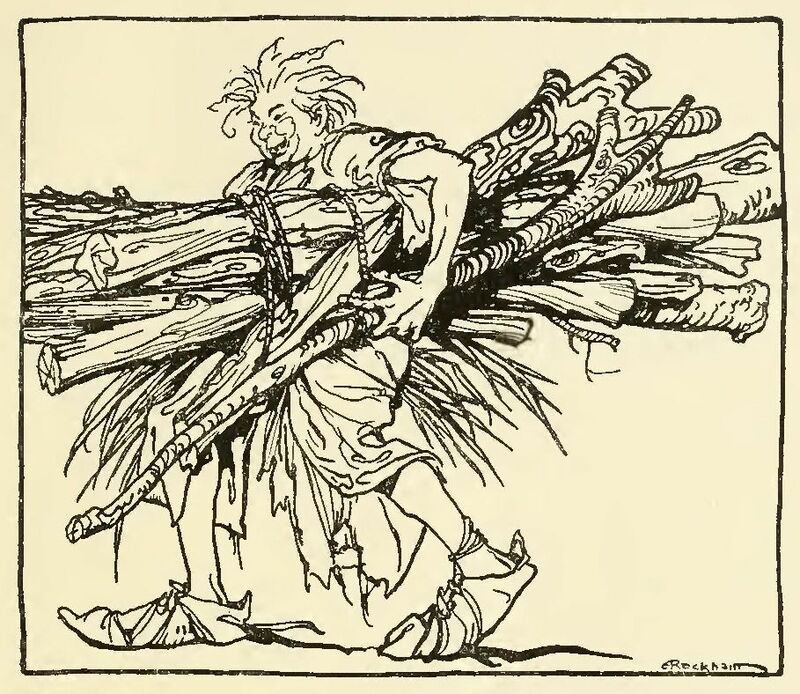 He thrust these under one arm and under the other he tucked a bundle of rushes for his bed, and with that one load he rushed up a house, well thatched and snug, and with the timber that remained over he made a bonfire on the floor of the house. His companion sat at a distance regarding the work with rage and aversion. “The tooth that does not help gets no helping,” the other replied. In a short time the Carl returned with a wild boar which he had run down. He cooked the beast over his bonfire and ate one half of it, leaving the other half for his breakfast. Then he lay down on the rushes, and in two turns he fell asleep. But Cael lay out on the side of the hill, and if he went to sleep that night he slept fasting. It was he, however, who awakened the Carl in the morning. Cael began to race then, and he was glad of the start, for his antagonist made so little account of him that he did not know what to expect when the Carl would begin to run. “Yet,” said Cael to himself, “with an hour’s start the beggarman will have to move his bones if he wants to catch on me,” and he settled down to a good, pelting race. At the end of an hour the Carl awoke. He ate the second half of the boar, and he tied the unpicked bones in the tail of his coat. Then with a great rattling of the boar’s bones he started. 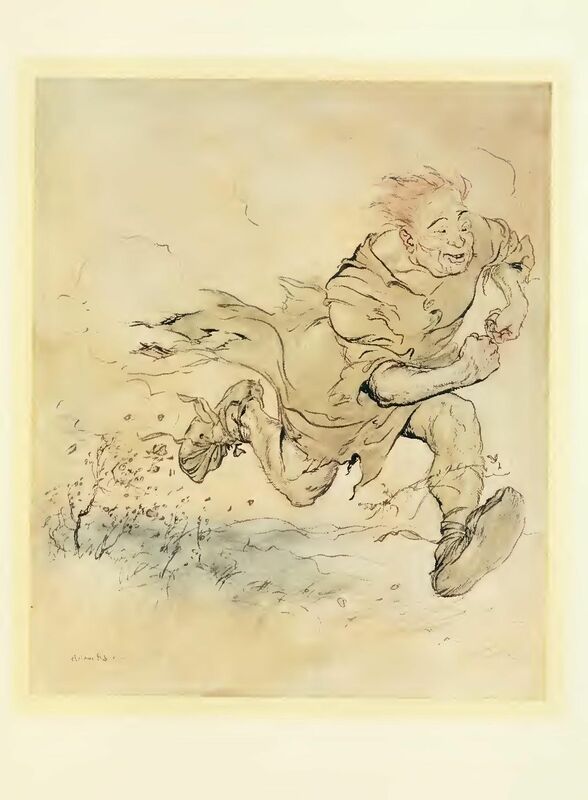 It is hard to tell how he ran or at what speed he ran, but he went forward in great two-legged jumps, and at times he moved in immense one-legged, mud-spattering hops, and at times again, with wide-stretched, far-flung, terrible-tramping, space-destroying legs he ran. He left the swallows behind as if they were asleep. He caught up on a red deer, jumped over it, and left it standing. The wind was always behind him, for he outran it every time; and he caught up in jumps and bounces on Cael of the Iron, although Cael was running well, with his fists up and his head back and his two legs flying in and out so vigorously that you could not see them because of that speedy movement. Trotting by the side of Cael, the Carl thrust a hand into the tail of his coat and pulled out a fistfull of red bones. Cael then began to move his limbs as if they were the wings of a fly, or the fins of a little fish, or as if they were the six legs of a terrified spider. “I am running,” he gasped. “But try and run like this,” the Carl admonished, and he gave a wriggling bound and a sudden outstretching and scurrying of shanks, and he disappeared from Cael’s sight in one wild spatter of big boots. He settled then to a determined, savage, implacable trot. He caught up on the Carl at last, for the latter had stopped to eat blackberries from the bushes on the road, and when he drew nigh, Cael began to jeer and sneer angrily at the Carl. “Who lost the tails of his coat?” he roared. “Don’t ask riddles of a man that’s eating blackberries,” the Carl rebuked him. “The dog without a tall and the coat without a tail,” cried Cael. “I give it up,” the Carl mumbled. “It’s yourself, beggarman,” jeered Cael. “I am myself,” the Carl gurgled through a mouthful of blackberries, “and as I am myself, how can it be myself? That is a silly riddle,” he burbled. “Not half a second will I wait,” Cael replied, and he began to run towards Ben Edair as a lover runs to his maiden or as a bee flies to his hive. “I haven’t had half my share of blackberries either,” the Carl lamented as he started to run backwards for his coat-tails. He ran determinedly on that backward journey, and as the path he had travelled was beaten out as if it had been trampled by an hundred bulls yoked neck to neck, he was able to find the two bushes and the two coat-tails. He sewed them on his coat. Then he sprang up, and he took to a fit and a vortex and an exasperation of running for which no description may be found. The thumping of his big boots grew as con-tinuous as the pattering of hailstones on a roof, and the wind of his passage blew trees down. The beasts that were ranging beside his path dropped dead from concussion, and the steam that snored from his nose blew birds into bits and made great lumps of cloud fall out of the sky. He again caught up on Cael, who was running with his head down and his toes up. And with that he incensed and exploded himself into an eye-blinding, continuous, waggle and complexity of boots that left Cael behind him in a flash. “I will run until I burst,” sobbed Cael, and he screwed agitation and despair into his legs until he hummed and buzzed like a blue-bottle on a window. Five miles from Ben Edair the Carl stopped, for he had again come among blackberries. He ate of these until he was no more than a sack of juice, and when he heard the humming and buzzing of Cael of the Iron he mourned and lamented that he could not wait to eat his fill He took off his coat, stuffed it full of blackberries, swung it on his shoulders, and went bounding stoutly and nimbly for Ben Edair. It would be hard to tell of the terror that was in Fionn’s breast and in the hearts of the Fianna while they attended the conclusion of that race. They discussed it unendingly, and at some moment of the day a man upbraided Fionn because he had not found Caelte the son of Rona’n as had been agreed on. “There is no one can run like Caelte,” one man averred. “He covers the ground,” said another. The messengers began to run through his tent at minute intervals calling “nothing,” “nothing,” “nothing,” as they paused and darted away. And the words, “nothing, nothing, nothing,” began to drowse into the brains of every person present. “What can we hope from that Carl?” a champion demanded savagely. “Nothing,” cried a messenger who stood and sped. “A clump!” cried a champion. “Nothing,” cried a messenger, and was sped as he spoke. Rage began to gnaw in Fionn’s soul, and a red haze danced and flickered before his eyes. His hands began to twitch and a desire crept over him to seize on champions by the neck, and to shake and worry and rage among them like a wild dog raging among sheep. “Where to, O Fionn?” said a champion humbly. “To the hill-top,” said Fionn, and he stalked on. What do you see?” Fionn demanded of the watcher. “What do you see?” said Fionn. “I will look myself,” said Fionn, and his great brow bent forward and gloomed afar. “What can you see, O Fionn?” said the watcher. “I can see nothing,” said Fionn, and he projected again his grim, gaunt forehead. For it seemed as if the watcher stared with his whole face, aye, and with his hands; but Fionn brooded weightedly on distance with his puckered and crannied brow. “What can you see?” said Fionn. “I see nothing,” said the watcher. “I do not know if I see or if I surmise, but something moves,” said Fionn. “There is a trample,” he said. “There is a dust,” he said. “I see a man,” said the eagle-eyed watcher. And again they stared, until their straining eyes grew dim with tears and winks, and they saw trees that stood up and sat down, and fields that wobbled and spun round and round in a giddily swirling world. “There is a man,” Cona’n roared. “A man there is,” cried another. “And he is carrying a man on his back,” said the watcher. “It is Cael of the Iron carrying the Carl on his back,” he groaned. “The great pork!” a man gritted. But the eagle-eyed watcher watched until his eyes narrowed and became pin-points, and he ceased to be a man and became an optic. And they waited, looking no longer on that scarcely perceptible speck in the distance, but straining upon the eye of the watcher as though they would penetrate it and look through it. “Are you sure?” said Fionn in a voice that rumbled and vibrated like thunder. Then the Fianna gave a roar of exultation, and each man seized his neighbour and kissed him on both cheeks; and they gripped hands about Fionn, and they danced round and round in a great circle, roaring with laughter and relief, in the ecstasy which only comes where grisly fear has been and whence that bony jowl has taken itself away. The Carl of the Drab Coat came bumping and stumping and clumping into the camp, and was surrounded by a multitude that adored him and hailed him with tears. And he bawled, “Meal, meal!” until he bawled everybody into silence. “For the inside of my mouth,” said the Carl, “for the recesses and crannies and deep-down profundities of my stomach. Meal, meal!” he lamented. The Carl put his coat on the ground, opened it carefully, and revealed a store of blackberries, squashed, crushed, mangled, democratic, ill-looking. “What of the race, my pulse?” said Fionn. Into the centre of the mess of blackberries he discharged a barrel of meal, and be mixed the two up and through, and round and down, until the pile of white-black, red-brown slibber-slobber reached up to his shoulders. Then he commenced to paw and impel and project and cram the mixture into his mouth, and between each mouthful he sighed a contented sigh, and during every mouthful he gurgled an oozy gurgle. But while Fionn and the Fianna stared like lost minds upon the Carl, there came a sound of buzzing, as if a hornet or a queen of the wasps or a savage, steep-winged griffin was hovering about them, and looking away they saw Cael of the Iron charging on them with a monstrous extension and scurry of his legs. He had a sword in his hand, and there was nothing in his face but redness and ferocity. Fear fell llke night around the Fianna, and they stood with slack knees and hanging hands waiting for death. But the Carl lifted a pawful of his oozy slop and discharged this at Cael with such a smash that the man’s head spun off his shoulders and hopped along the ground. The Carl then picked up the head and threw it at the body with such aim and force that the neck part of the head jammed into the neck part of the body and stuck there, as good a head as ever, you would have said, but that it bad got twisted the wrong way round. The Carl then lashed his opponent hand and foot. “Now, dear heart, do you still claim tribute and lordship of Ireland?” said he. The Carl lifted him then and put him sitting into his ship. Then he raised his big boot and gave the boat a kick that drove it seven leagues out into the sea, and that was how the adventure of Cael of the Iron finished. “Who are you, sir?” said Fionn to the Carl. But before answering the Carl’s shape changed into one of splendour and delight. “I am ruler of the Shi’ of Rath Cruachan,” he said. Then Fionn mac Uail made a feast and a banquet for the jovial god, and with that the tale is ended of the King of Thessaly’s son and the Carl of the Drab Coat. You might also enjoy other stories by James Stephens.